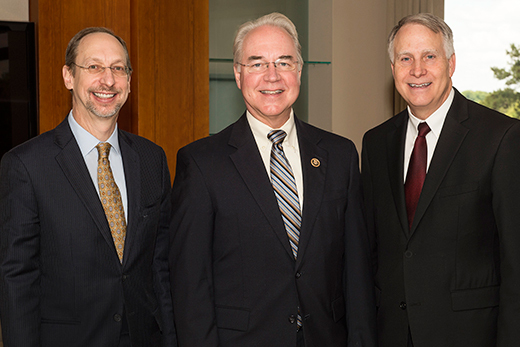 U.S. Rep. Tom Price (R-Ga.), center, met with Jonathan Lewin, Emory’s executive vice president for health affairs, and Emory President James Wagner on May 4. Price, who serves as chair of the U.S. House Budget Committee, came to campus to speak to a town hall meeting on NIH and NSF funding presented by the Emory Science Advocacy Network, a graduate student group that seeks to promote biomedical research funding through advocacy and education. Photo by Jack Kearse. Rep. Tom Price (R-GA) expressed support for strong federal funding of scientific and biomedical research in a town hall meeting Wednesday with Emory faculty and students, organized by the graduate student group Emory Science Advocacy Network. However, a “smaller bump,” more along the lines of the $2 billion increase in NIH funding passed by Congress in December, could be possible, he said. Price also advocated streamlining the Food and Drug Administration’s approval processes for new antibiotics and medical devices, and giving scientists more discretion in how federal research dollars are allocated. In a question-and-answer session, Emory ethnobotanist Cassandra Quave urged Price to have Congress give increased attention to the problem of antibiotic resistance, in which some bacterial infections are becoming difficult to treat. “Yes, we need more resources going into this,” Price said, going on to support a “dual track” approval process for new antibiotics. Price expressed concerns that the United States’ role as a leader in medical innovation was waning, because of regulatory constraints that drive devices such as heart valves to be tested elsewhere first. “We’re already losing bright minds,” he said, citing how colleagues from other surgical specialties were visiting other countries to learn new techniques. Price: "Get government out of the way of innovation"
Price, who represents parts of Cobb, DeKalb and Fulton counties, was appointed chair of the House Budget Committee at the end of 2014, replacing Rep. Paul Ryan (R-WI). Before his election to Congress in 2004, Price was an orthopedic surgeon. He grew up and went to medical school in Michigan, and came to Georgia for his orthopedic surgery residency at Emory. He was an assistant professor at Emory and medical director of the Orthopedic Clinic at Grady Memorial Hospital, while he was a member of the state senate. Before taking questions, Price explained how the federal budget is dominated by mandatory spending on programs such as Medicare and Social Security, as well as interest payments. He noted that interest payments on the national debt, at $230 billion per year, dwarf federal research budgets in all agencies combined — even at a time of low interest rates. Biochemist Rick Kahn asked the congressman whether it would be feasible to separate the NIH budget from the rest of the Health and Human Services budget. “Sure, it’s possible, but I’m not sure you want to do that,” Price said. He continued, saying that he wanted his fellow politicians to have a lighter touch in steering research dollars to one disease or area of medicine versus another, noting that the long-standing NIH set-aside for HIV/AIDS lasted too long before its elimination last year. Alessandra Salgueiro, a graduate student in cancer biology, asked Price about the most effective ways to contact members of Congress on policy issues. What tends not to work are formal letters sent to Washington, he suggested. But face-to-face appointments, especially at his offices in Georgia, are better, he said. “For many things, the person that is really important for you to see is my health adviser, because that’s the person I’m going to turn to later,” he said. Price said he was interested in a proposal, described by geneticist Tamara Caspary, to make it easier for scientists to apply for grants by postponing some of the administrative hurdles until the grant is actually awarded. “One of my passions is to get government out of the way of innovation,” he said.